If you're part of an Office 365 organization or use an Exchange account, you can respond to polls other users in your organization send to you. If you receive a poll, you'll see a message in the InfoBar. Note: This feature does not work with Outlook.com, Hotmail.com, or Live.com accounts. Open the message, and click Home. In the Respond group, click Vote, and then click your choice. 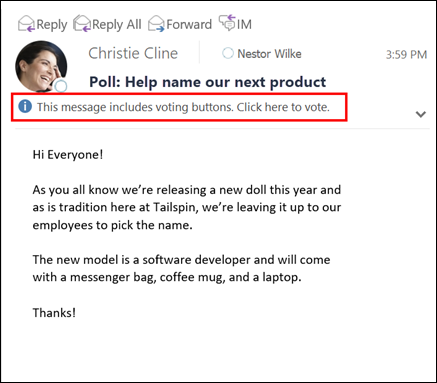 You will be prompted to choose whether you want to include a message with your vote before the response is sent.